Why do we boo our own? In a world of football tribalism, one contradictions that bemuses me to this day remains the booing of our own players. Let’s think about this for a moment. We attend a match to support our team to victory, often at all costs and with a genuine distain for the opposition. Intra and Intercity rivalries play a significant part in football and at time emotions boil over and hatred rains down from the terraces. But hatred for our own players!?! It is football’s great paradox. We attend a match as “supporters”, yet we turn against our own players and we boo them? I understand that people become frustrated, but can someone please explain to me the logic of booing your own player? Let’s for a minute take this away from the current squad of players (who by the way are midway through our best season since 2004-5). In 1997-98 Everton were fighting relegation from the Premier League. The squad was made up of a myriad of players not fit to represent Everton, yet they were giving their all to keep the Blues in English footballs top flight. Enter Gareth Farrelly. I am sure you all know how the story ends, a wonderful long range effort that just, and I mean just, kept Everton in the Premier League. But Gareth had become the subject of the Goodison boo boys. At times, he was booed simply for touching the football and this by his own fans. You would think, those who pay their money to watch Everton would be grateful, saved from watching dour Championship football by a young player trying to make his way in the game. But instead we chose to hound him out of Goodison and into footballing oblivion. Players, who I am not alone in thinking have written themselves into the history of this club as the best players of a generation have been subject to the jeers and moans of the crowd too. 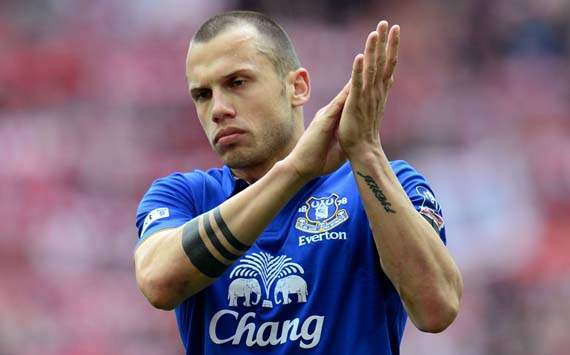 Former players of the year, Mikel Arteta, Tim Cahill and now Johnny Heitinga have all endured difficult times and I cannot remember a single one of them playing at their best while the crowd have been on their back. Put quite simply it does not help the players and it certainly does not help the team.